THE ALL-NEW KGI NOVEL from the “incredibly awesome" (Jaci Burton) #1 New York Times bestselling author of When Day Breaks.The Kelly Group International (KGI): A super-elite, top secret, family-run business.Qualifications: High intelligence, rock-hard body, military background.Mission: Hostage/kidnap victim recovery. Intelligence gathering. Handling jobs the U.S. government can’t...The enigmatic Hancock has been both opponent and ally to the KGI teams for as long as they've known him. 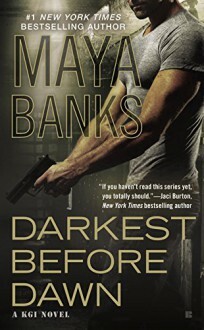 Always working a deep game, Hancock's true allegiance has never been apparent, but one thing is for certain—he never lets anything get in the way of duty.But now, his absolute belief in the primacy of his ultimate goal is challenged by a captive he's been ordered to guard, no matter how much she suffers in her prison. She's the only woman who's ever managed to penetrate the rigid walls surrounding his icy heart, but will he allow his perplexing feelings for the beautiful victim to destroy a mission he's spent years working to complete or will he be forced to sacrifice her for “the greater good.”From the Paperback edition.